Low-income Hispanic Type 2 diabetes patients who received health-related text messages every day for six months saw improvements in their blood sugar levels that equaled those resulting from some glucose- lowering medications, Scripps Health reported Friday. The clinical trial by researchers with the Scripps Whittier Diabetes Institute represents the first study to look at the use of text messages to help Hispanics manage the condition on their own, by controlling their glucose intake. The results were released in conjunction with the first day of the American Diabetes Association’s 77th Scientific Sessions at the San Diego Convention Center, and were published online by the journal Diabetes Care. Diabetes afflicts 29.1 million Americans and Hispanics face a higher risk of developing the disease — 13.9 percent compared to 7.6 percent for non- Hispanic whites, according to the American Diabetes Institute. The researchers said they conducted their study between October 2012 and August 2014, with 126 participants recruited from medical clinics operated by the nonprofit Neighborhood Healthcare in San Diego and Riverside counties. Participants were either uninsured or received coverage through MediCal, according to Scripps Health. A majority were middle-aged, female, born in Mexico and reported less than a ninth-grade education. They watched a 15-minute diabetes educational video, received a blood glucose meter and instructions on using it, and were given access to a primary care physician, a certified diabetes educator and group diabetes self- management education. From that pool, 63 were randomly assigned to a study group that received two to three short text messages a day at the beginning of the trial, which tapered off slightly over the next six months. 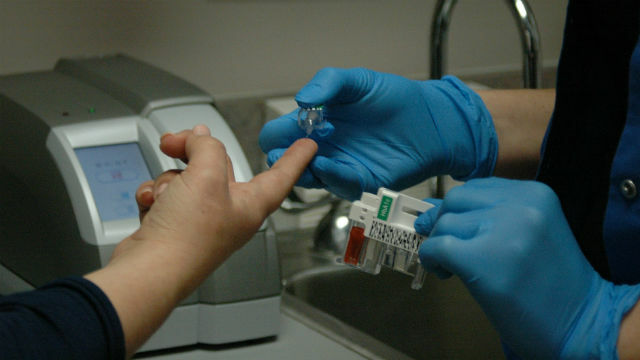 The study focused on hemoglobin A1C, a blood test that measures average blood glucose during the previous two to three months. For people who don’t have diabetes, a normal A1C level is below 5.7 percent. At the start of the study, the combined participant groups registered a baseline mean A1C of 9.5 percent. After three months, the A1C for the group receiving the texts had improved to 8.5 percent while the control group had an A1C of 9.3 percent. At six months, the study group’s A1C was still 8.5 percent while the control group registered a 9.4 percent. While the study group fared better than the control group, the improvement from text messaging was on par with what patients usually see when taking medication. Mural artist Gloria Favela, 48, of Valley Center, was one of the study group participants who saw big improvements. “As the program continued, my A1C was dropping, and it eventually got to a really healthy level,” Favela said. She said the messages were particularly helpful on days when her attention was focused on painting, not on monitoring her blood sugar or focusing on what she was eating and drinking. She said the “nice, gentle reminders” worked well for her. When the trial ended, 96 percent of the study group participants said the text messages greatly helped them to manage their diabetes. The same percentage said they would continue receiving the text messages if given the choice, and 97 percent said they would recommend the program to friends and family members, according to Scripps Health. Funding for the study came from the McKesson Foundation and LifeScan Inc.